Our church care ministry is the heartbeat of our congregation. We love being Jesus’ hands and feet to the people in our community who have a particular need that we can effectively meet. As the ministry has evolved, we realized one easy win would be to give a break to parents who have no money for babysitters. So, we set up a room for kids 8 and under as a safe place to play while their parents are getting help, praying with someone, or just relaxing with a cup of coffee. In the beginning, we were just a room with some toys. As word got out and our ministry grew, we were able to secure a larger facility, which was fantastic, but we still had some of the same issues with trying to keep infants safe while 8-year-old boys wanted to kick a soccer ball and 3-year-old girls wanted to play with dolls. On top of that, no two days were ever the same—some days everyone wanted to watch a DVD, other days the craft table was a big hit, and other days we’d play the hot lava floor game for hours. Enter Screenflex Room Dividers. The day we started using room dividers is the day the kids’ care ministry took off. Volunteers have the flexibility to partition the room off based on that day’s needs. There is always the ability to wall off a section of the room for infants and unsteady toddlers, who can then explore without fear of being hit by a rogue ball or having their toys taken away by an older kid declaring, “MINE!” Quieter kids who want to read or watch a DVD can do so freely because the dividers not only carve out space but also cut down the noise from the more active parts of the room. We frequently move any sleeping babies into this area because of the quiet. The dividers also give us a built-in art gallery, and kids are always proud to walk their work over from the craft table to the dividers and pin it up to decorate the room and show off their work to parents and other volunteers. Because the dividers are lightweight and easy to move, volunteers have no problems changing things on the fly. The mix of kids at noon can be very different from the combination of kids at 9 AM, which would be problematic in a fixed space setting but is no problem in a flexible space setting. 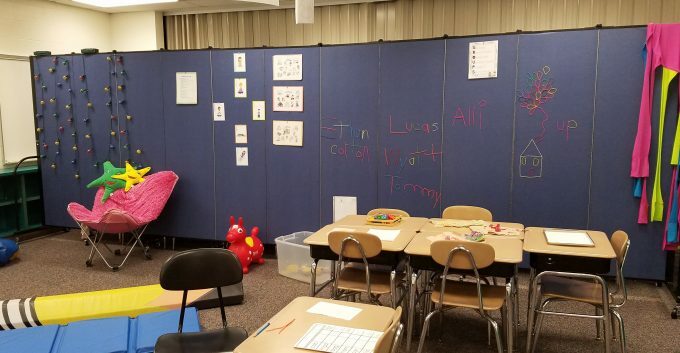 We also saw our volunteer retention rate go up when we started using the room dividers because their frustration levels went way down when they were able to control the room based on the current needs. Our only regret is not bringing the dividers in sooner, and we’re looking to see where else we could use them to streamline our church care ministry services.